The Savanna Museum & Cultural Center opened in 2011 and offers exciting and constantly changing events and traveling exhibits. The Museum’s permanent displays, exhibits & collections are housed on the second and third floors. On the second floor is Big Band Leader Wayne King’s Collection Room, and a huge HO scale operating model railroad layout that depicts the Savanna Railroading in the 1950’s. The railroad has the CB&Q (Burlington Railroad and the Milwaukee Road on the layout. The third floor has a collection of the most incredible civil war displays anywhere. 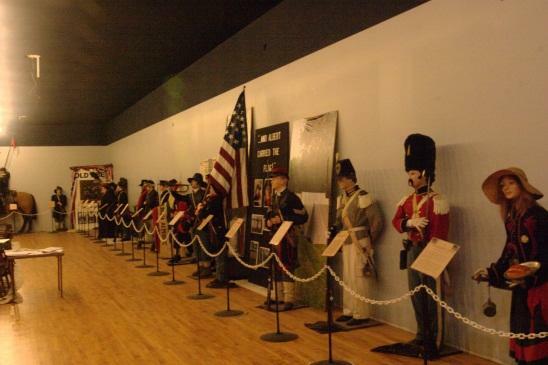 Mr. Gene Wright, a retired history teacher has spent his entire life collecting the civil war displays and proudly displays over 120 Mannequins and each one has a short story posted on it. This is a must see! The Savanna Historical Society, NFP is constructing the Savanna Museum and Cultural Center by renovating the building since 2008. More than 50 volunteers have contributed over 8,000 volunteer hours. In 2010, the Society received the Illinois Governor’s Hometown Award in recognition. 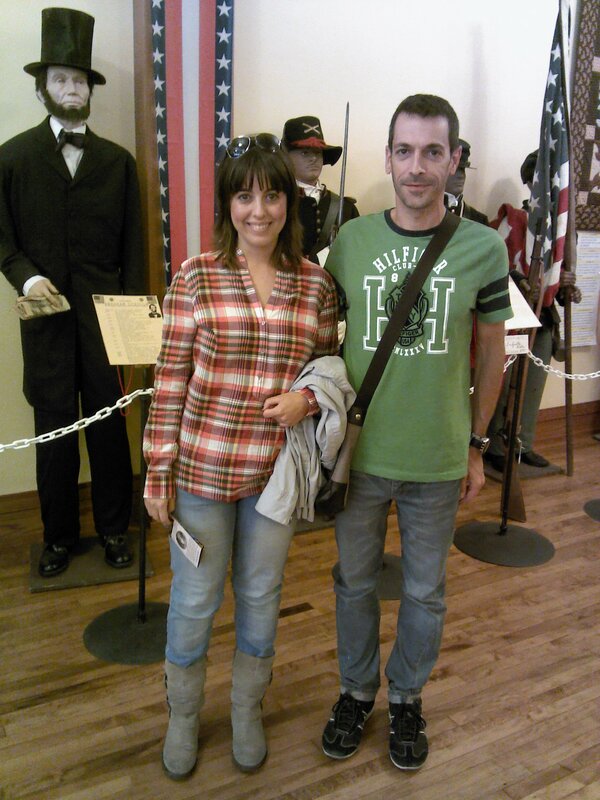 Recent visitors to the museum include this couple from Madrid, Spain. Laura Cordero and Fco Javier Martinez stopped by the Savanna Museum and Cultural Center several weeks ago. We also had a visit from the P.E.O. group in the QuadCities. The P.E.O. 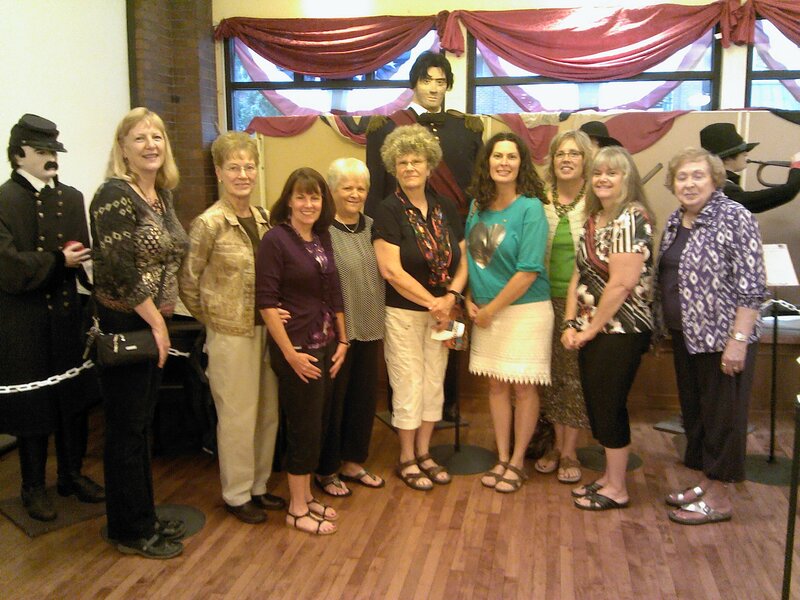 group came for the day to visit the display along with shopping at Land of Oz Dolls, Sassy Stems, River Valley Designs, and the new Savanna Marketplace. They had lunch at Cafe Crumbles while visiting Savanna. The Savanna Historical Society is pleased to announce the reopening of Gene Wright’s “Gallery of Civil War Soldiers” exhibit at the Savanna Museum and Cultural Center. Gene’s boys will be moving downstairs for exhibition starting on Saturday, August 3rd. The exhibit will be open Saturdays and Sundays through October 13th from 11:00 am to 4:00 pm each day. Gene Wright’s “ Gallery of Civil War Soldiers” tells a hundred short stories of the Civil War. This collection is the life’s work of local history teacher Professor Gene Wright, who has hand-made over 100 life-size mannequins. Dressed in authentic replicas of Civil War era uniforms, each mannequin has his or her own story. From a twelve-year-old drummer boy to the Greybeard Regiment, to the woman who served as a man, each mannequin shines a light on a special moment in history. Please stop by and visit this unique piece of history at 406 Main St. in Savanna. Bill Dayton, center, shown with Savanna Historical Society members John LeComte and Jean Ferris, recently gave a $5,000 donation to the Society. He said he is very proud to give to the SHS to help promote the “Give Us a Lift” campaign to raise funds for the new elevator. 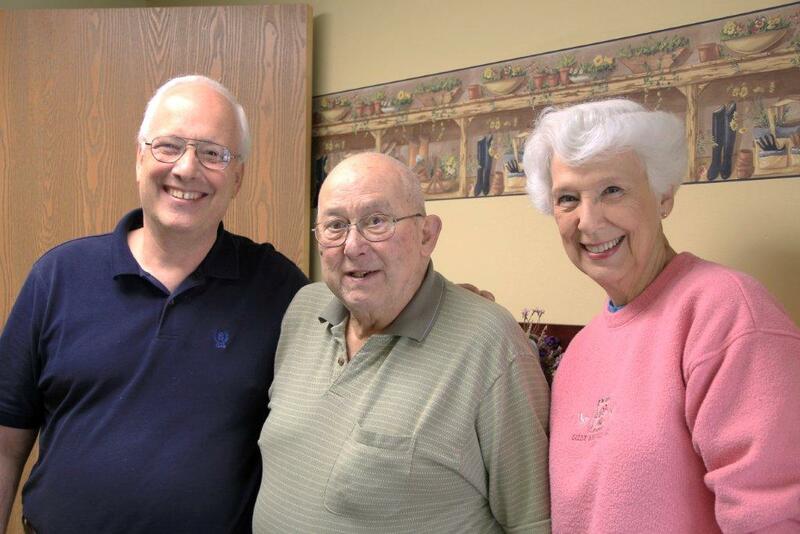 Though retired, Bill continues to be a staunch supporter of community projects. The SHS is very grateful for his contribution. New Traveling Exhibition at the Savanna Museum and Cultural Center Tells the Story of Abraham Lincoln’s Struggle to Meet the Constitutional Challenges of the Civil War. “Lincoln: The Constitution and the Civil War,” a traveling exhibition opening at the Savanna Museum and Cultural Center on Friday, June 14th, examines how President Lincoln used the Constitution to confront three intertwined crises of the Civil War-the secession of Southern states, slavery and wartime civil liberties. Lincoln is widely acknowledged as one of America’s greatest presidents, but his historical reputation is contested. Was he a calculating politician willing to accommodate slavery, or a principled leader justly celebrated as the Great Emancipator? This exhibition provides no easy answers. Rather, it encourages visitors to form a nuanced view of Lincoln by engaging them with Lincoln’s struggle to reconcile his policy preferences with basic American ideals of liberty and equality. This exhibition develops a more complete understanding of Abraham Lincoln as president and the Civil War as the nation’s gravest constitutional crisis. Abraham Lincoln was elected President of the United States in 1860, at a time when the nation was on the brink of war. Lincoln struggled to resolve the basic questions that divided Americans at the most perilous moment in the nation’s history: Was the United States truly one nation, or was it a confederacy of sovereign and separate states? How could a country founded on the belief that “all men are created equal” tolerate slavery? In a national crisis, would civil liberties be secure? President Lincoln used the Constitution to confront these three crises of war, ultimately reinventing the Constitution and the promise of American life. The Savanna Historical Society and the Savanna Public Library worked cooperatively to bring this exhibition to Savanna. Details of free programs and other events for the public in connection with the exhibition will be listed in local newspapers, flyers and at the museum. “Lincoln: The Constitution and the Civil War” will be on display at the museum, 406 Main Street, until July 26th. Hours are Wed.- Fri. 5-8 pm, Sat. – Sun. Noon- 5pm. Admission is free .